Replies: 91 (Who? ), Viewed: 120889 times. #1 21st Apr 2006 at 6:14 AM Last edited by lidiqnata : 23rd Dec 2013 at 7:54 PM. By default, custom hair recolours will show up in the custom (*) bin. If you would like your hair recolours (your own creations, or those created by others that you use in your own game) to show up under the four regular colours, it's relatively easy to do; these instructions explain the steps to place a hair recolour in the proper bin in SimPE. This can also be done using DatGen. 1. First, backup the files you are going to be editing. Select them and copy them to somewhere else, like a folder called Backup, or something equally easy to remember, just in case you mess up. 2. Secondly, backup your files. Seriously. 4. Often, one is binning a bunch of hair at once, and it can be confusing to remember which file is for which colour. However, you can take a glance at the textures in the recolour package by clicking on the Texture Image (TXTR) entry in the Resource Tree (A) and then looking at the textures contained in the file (B). Look under Plugin view to see the textures (C). If you already know what colour you intend to bin this hair recolour under, go ahead to the next step. Make sure you Commit once you've made the changes (F). 6. 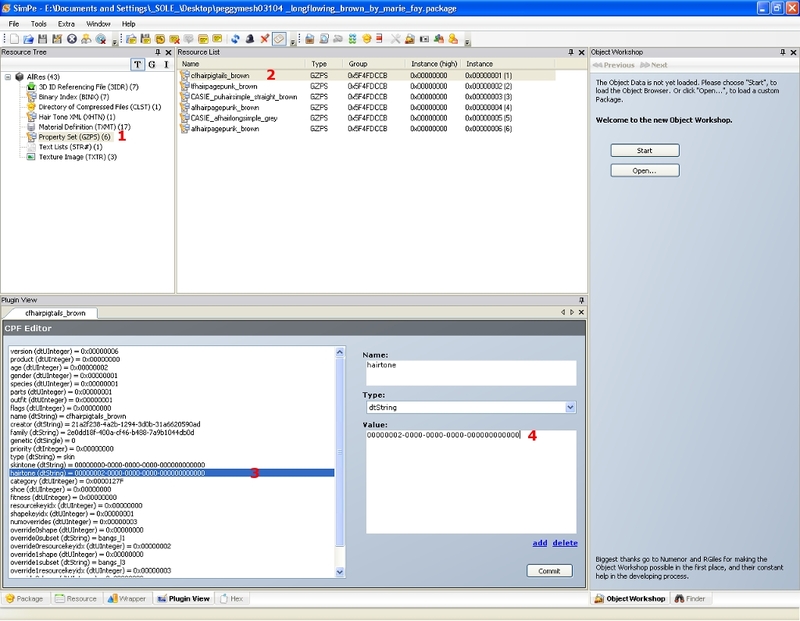 Now, under the Resource Tree, choose Property Set (GZPS) (A). Click on the first one listed in the list of property sets (B). Under Plugin View (C), look for the line "hairtone (dtString)" (D) and change it to the same thing you did for the eyebrows in the Hairtone XML (E). Make sure you hit commit after you've made the changes (F). 7. Repeat Step 6 for all of the rest of the Property Sets in the file, making sure to Commit after changing each one. 9. File - Save to save your changes to the file. 10. Move your modified file into your SavedSims or Downloads folder and test to make sure it's working correctly in Body Shop and/or the game. Okay, call me stupid... but I have no idea how to find all the files I want to move from the correct hair bins to the custom bin... and how to delete certain hair for certain ages, because they have the hair already. Melodie9 made the adult hair available to toddlers and children. but it also shows up in the adult bins too... and I don't want this... because the hair was accessable to them already... *so frustrated* I hope I am being clear in what I am trying to say....if I am not, feel free to yell at me. Rayne... If you want to put them in the custom bin instead of the correct genetic colours (i.e. do the exact opposite of what this is showing), the easiest way to do that is to just make a new recolour of it in Body Shop and just Import to Game as-is - it'll create a duplicate recolour, but you can then remove the original recolour and have your new one in the place you want. If you can't find the original recolour, try scanning your Downloads folder with Clean Installer - it'll show you the texture images which can help in figuring out what's what. 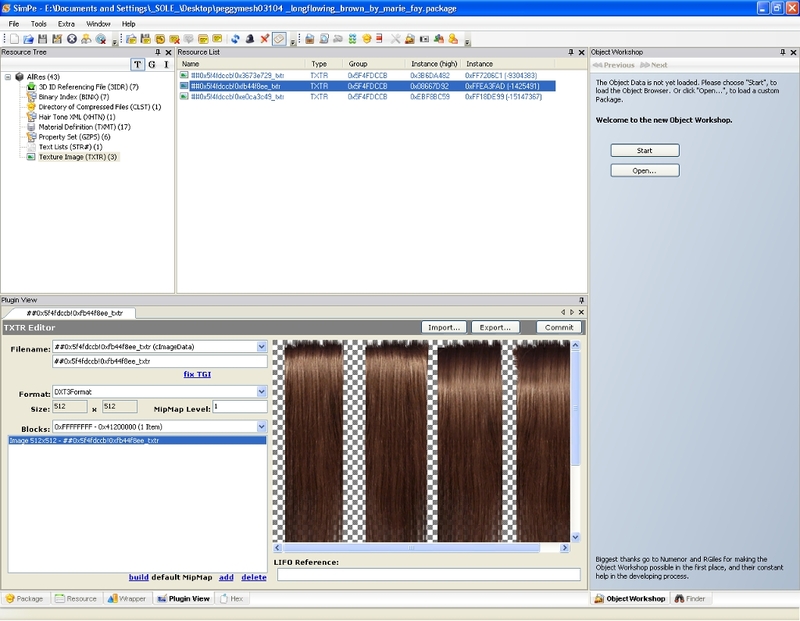 Alternately, if you want to use SimPE to do it and apply it to the existing recolour files, you'll have to find them in your downloads, open the files, and then look under the Hairtone XML. There should be only one. Find the "family" value and copy it. Open the first Property Set (there will be one for each age) and find the "hairtone" line. 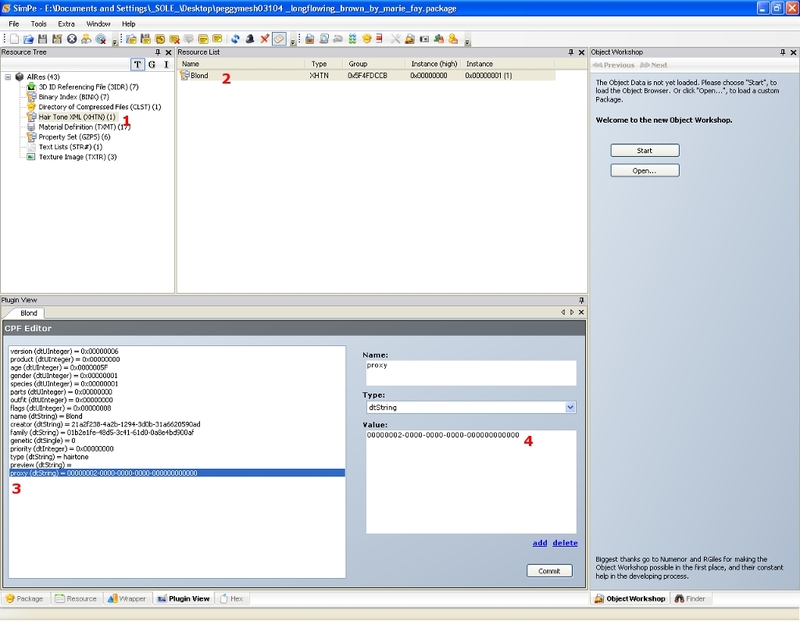 Paste the "family" value from the Hairtone XML over the hairtone value in the Property Set. Commit, and repeat for each Property Set in the file. Save when you've done all of them. That'll switch that binned hair back to custom. If you plan on doing any recolours in the future of melodie9's meshes, and you want sims to grow up wearing them, don't remove the other ages or they'll age into the wrong hairstyle. But if you never really age sims from one group to another (like me - I only open the game to test stuff so nobody ever ages), you can remove the other ages by this method. This message has been deleted by Blackjacksims. This message has been deleted by Faylen. Reason: Well, thank you for sharing. #5 8th Jul 2006 at 8:06 PM Last edited by DremeMynd : 8th Jul 2006 at 9:57 PM. The brow IS binned correctly if XTOL hairtone is changed to the desired hair color value. If you have a custom browshape with all 5 regular colors, if the XTOL family is the same in all the packages, they will switch properly as you change the sim's haircolor. If you want to bin an eyebrow with a custom haircolor, you need to copy the hairtone value from the hair's property set, and use it in the hair's XHTN proxy field. You also need to use the same value in the brow's XTOL hairtone field. For all possible brow choices on your elder sims, you need to make sure the grey property set hairtone field for your custom hair is set to the grey hairtone value. This assumes your custom hair turns grey(white) when your sim becomes an elder. Every color of your color binned brows will populate the grey brow bin with a copy of the brow if you use the packages as they default from the body shop. In order to stop this I did two things. First I made a copy of one of the colored packages and named it "grey". Next I deleted some of the resources in each of the packages. In the colored packages I deleted the texture overlay(XTOL) texture image(TXTR) and material definition(TXMT) for the male and female grey brows, leaving all the colored brows. In the grey package I deleted the same resources for all the colored brows, leaving only the two grey ones. This worked for me. C:\Program Files\EA GAMES\The Sims 2\TSData\Res\Catalog\Skins\Skins.package - you can find hairstyle, brow, facial hair families there, in the XTOL file. When I have more than one color of a hairstyle, I have also found that I need to remove the grey property set from all but one of the colors. I cloned and recolored some maxis hair, put the correct family on it (so it is associated with the hair it was cloned from) and then deleted the grey property set and they worked great - pulling the grey version of the style from the maxis default. Well - I tested this with ugly blue hair (2 female, 1 male) and brows (1 custom, 1 maxis recolor) in bodyshop. They all use the same hairtone value. I can make sims with it in bodyshop - and import them into the game. They show up fine, play fine, and when they have babies, they have blue haired babies which cycle through the two different female hair styles if they're girls. Because the custom hair is dominant, the blue hair shows up whether they mate with someone with blue hair or not. It also carries a recessive behind it properly. The problem is that I don't see the hair in the sim creation utility of the game itself. Since I make my sims in BodyShop, this won't effect me much, but it's a bummer to be fiddling in the game, and to not be able to choose your new haircolor properly. If anyone knows why they don't show up I'd like to know. Ugh, I am so frustrated. How do I know which files are hair files from crazy names like 5a943ifje4_848000e8uw? Well, you have to be somewhat organized to be able to do this. When you download things, you can rename them so you know what they are. You can also open the files in SimPE to get an idea of what they are from looking around at the resources within. Clean Installer also has a way of scanning your downloads and sorting them by type, which isn't perfect, but it helps narrow things down quite a bit. Will the renaming/editing of files affect the Sims I've already created using those files? Renaming definitely doesn't mess anything up - rename recolours however ya like, whether or not they're already used on a sim, and it'll be fine. Just about everything can be renamed - except CEP, possibly CAS screens (not 100% sure on that one), installed lots, and certain multi-part hacks like the InSIMenator. All Body Shop content and all normal (non-hacked) objects and recolours should be able to be renamed whenever you want without screwing anything up. Binning I don't think modifies those sims' genetics if the recolour's already used on 'em... but I don't think it messes them up either. You're not changing the actual parts of the file that the sim's info is pointing to, so it should be okay. I'd suggest trying to the binning before using any files in future, and backing stuff up if you try it on an existing sim, but I'm about 85% sure I've done it before myself and it worked okay. Is there a way to remove certain an age? For example, if a hair style is only designed for YA/A/E, is there a way to remove it from the bins for T/C/T? Yes, Lupusdragon... look through the other tutorials in this section. I believe SimplyStella created a tutorial on doing that. Wondering myself if I was to do this, when the game create random townies, is it also possible it will also pick a custom hair and not one of the maxis ones ? Yes, Citysim, when the game randomizes townies it will pick from all your binned hair - I have one girl who always mans the coffee bars in my town who wears some big fluffy red custom pigtails I have binned. I have a question. I'm trying to bin the long bob from Elau, but it will not let me save because it says the file is protected. So for anything that is protected, there is no way to get it in the correct color bin? And thank you for this tutorial. This is so awesome! I've never run into it saying a file is protected, misspriscris. I'd assume the file is maybe read-only. Check its properties in Windows and uncheck "Read Only" if that's checked. Great tutorial! Just what I need. I have one stupid question, though. You mentioned renaming files. Do you mean I can go to Windows Explorer and rename them by using F2, just like any other type of renamable file? You can rename your files in your saved sims folder to anything you want, it won't change how the file works. So you can turn it from the horrible "7f8d8e85_teentop.package" to "darsky-teenhaltertop-greenandpurple.package" Same for hair or whatever. Give it a good helpful descriptive name, with your name, the age, style and color in it. Iv finally finished a mesh that ive been working on for quite awhile but ive recently had to re-install my game, but having lost uni i only could install nightlife (which is what i created the new mesh in) i re-bought uni and managed to attach the mesh to the YA hair but it wont recolour, its just stays blonde. Is there anything i can do? Thanks for the tutorial. I am in process of binning all my hair into its correct color. If you have NL or OFB you can subfolder them in Downloads as well. I have 2 Separate Folders for Men and for Women. Then I have it separated into the 4 base colors and an other folder. The mesh goes in the main "Men" or "Women" folder and the colors go where they are supposed to. It is a very long process if you have lots of hair and i am an obsessive hair collector so i have hundreds of Meshes (yes just meshes not even including textures). I am also in process of logging every Hair mesh i have installed to possibly make a "Master Hair Mesh Text File". Which i can post on websites for others. So wish me luck. After a massive crash and the ensuing rebuild of my Downloads folder, I decided to give binning a try. I was intimidated at first but have just binned my first hair following your tutorial (tested in BodyShop and it's exactly where it should be now, whoot!). I think it took me all of four minutes to do my first one? And that was going extra slowly and reading each step two or three times before touching anything. It may be time-consuming to go through all my hairs to be binned, but I'm confident I should be able to handle it easily, thanks to this tutorial. Tossing may thanks and roses in your general direction! Thank you very much for taking the time to make this fabulous tutorial. Who knew it was that easy? I've spent this afternoon colour-binning all my custom hair, and now my sims can have many many hairstyles within their genetic hair colour! It has been a pet peeve of mine since I started downloading custom content, so I'm very glad to have been able to fix it. Many many thanks again. HP, thank you so much.. I've been being a big, fat chicken when it comes to doing this and this is just not that hard.. Thank you for making such a lovely easy tute so I could get through this. I've been looking for a tutorial for hair-binning for ages, and this is great! Thank you so much! Thanks very much - this tutorial is very clear and helpful.